Cinnamon. What comes to mind when you hear that word? Cinnamon buns, cinnamon glazed apples, snickerdoodles? It’s no secret that cinnamon and sugar are a great pair! But is there more to the relationship between sugar and cinnamon than just the great taste? People with pre­diabetes or type 2 diabetes must be very careful to manage blood sugar levels. This can be achieved by following a special diet, losing weight, exercising, and taking medications such as metformin. Now there is a common spice that is being investigated as a supplement to help control blood sugar. In 2013, NPR published an article stating that cinnamon can help lower blood sugar.1 But is this claim backed up by science? Researchers in the last few years have been studying the impact of cinnamon on the management of blood sugar and have had promising results. In 2003, researchers sought to determine if cinnamon could improve blood glucose levels in people with type 2 diabetes.2 In this study of 60 people with type 2 diabetes ranging in age from 45 to 58, subjects took either a placebo or one of three amounts of cinnamon: 1, 3, or 6 grams each day. After 40 days, the results showed that cinnamon in any of the three doses helps lower blood glucose levels 18­-29%, while no significant changes were reported in the placebo groups. Another study in 2006 of 79 diabetic patients looked at whether cinnamon extract helps improve glycemic control in patients with type 2 diabetes.3 Each person either received a capsule of 3 grams of cinnamon or a placebo three times a day for 4 months. The results showed that the reduction in fasting blood glucose levels in the patients receiving cinnamon (10.3%), was significantly greater than in the control group, who had a reduction of only 3.4%. However, no significant differences were seen in hemoglobin A1c, which is an indicator of average blood sugar levels over the past three months. A recent study that ran statistical tests on data from ten randomized controlled trials studying cinnamon’s effect on blood glucose found that cinnamon decreased fasting blood glucose levels by 24.59 mg/dl.4 There was no significant difference in the patients’ hemoglobin A1c. The study was unable to determine what the optimal dose of cinnamon or duration of treatment; this is an area where further research is needed. How does cinnamon do it? Researchers do not fully know how cinnamon works, but they believe it may increase the body’s levels of and sensitivity to insulin, the hormone that helps your cells take sugar out of the blood stream, thereby lowering blood sugar levels.5 In addition, cinnamon may slow the emptying of the stomach, so there is less of a spike of sugar in the bloodstream.6 There is debate among researchers about what dose of cinnamon should be used to manage blood sugar. As with any supplement, it is important to check with your doctor before adding cinnamon to your diet. If, after talking to your doctor, you decide to see if cinnamon works for you, it is important to choose the right kind of cinnamon. Cinnamon comes in two varieties, Cassia and Ceylon. Cassia is the more common type found in many supermarkets, however in higher doses, such as those used to control blood sugar, coumarin isolates (not to be confused with the blood thinner Coumadin) found in cinnamon can cause liver damage.1 The Ceylon variety of cinnamon has only trace amounts coumarin isolates, making it safer for the liver.7 So, if you plan to supplement your blood sugar management with cinnamon, ask a pharmacist to help you correctly select the Ceylon variety. While researchers still do not fully agree on the effectiveness of cinnamon as a supplement for controlling blood sugar in type 2 diabetics and pre­diabetics, many recent studies show promising results. The effects of cinnamon may not be enough to replace a drug intended to control blood sugar, but those with pre­diabetes or diabetes may find it a useful supplement to help manage their condition. What are your thoughts on using a natural supplement to manage a health condition? 1. Aubrey A. Cinnamon Can Help Lower Blood Sugar, But One Variety May Be Best. NPR 2013. Accessed October 15, 2015. 2. Khan A, Safdar M, Ali khan MM, Khattak KN, Anderson RA. Cinnamon improves glucose and lipids of people with type 2 diabetes. Diabetes Care. 2003;26(12):3215­8. 3. Mang B, Wolters M, Schmitt B, et al. Effects of a cinnamon extract on plasma glucose, HbA, and serum lipids in diabetes mellitus type 2. Eur J Clin Invest. 2006;36(5):340­4. 4. Allen RW, Schwartzman E, Baker WL, Coleman CI, Phung OJ. Cinnamon use in type 2 diabetes: an updated systematic review and meta­analysis. Ann Fam Med. 2013;11(5):452­9. 5. 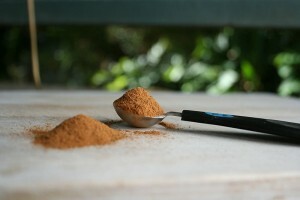 Kaiser C. Cinnamon’s Effect in Diabetes Uncertain. Cinnamon’s Ef ect in Diabetes Uncertain 2013. Accessed 2015. 6. Hlebowicz J, Darwiche G, Björgell O, Almér LO. Effect of cinnamon on postprandial blood glucose, gastric emptying, and satiety in healthy subjects. Am J Clin Nutr. 2007;85(6):1552­6. 7. Johannes L. Little Bit of Spice for Health, but Which One? WSJ 2013. Accessed 2015.